The Virtual Classroom Key moments are markers in the recording of the room session. They are individual for every participant, therefore everyone in the session can pin a specific time from the session while it goes on (e.g. mark a key point) . All the sessions are recorded (including video and audio, chat, whiteboard, etc.). Hence, you can play the recordings after the session ends. Placing a key moment allows you to jump to the point you’ve pinned in the recording. Note: Video archives are available only for the Premium Virtual Classroom plan. Just click on the New Keypoint button. 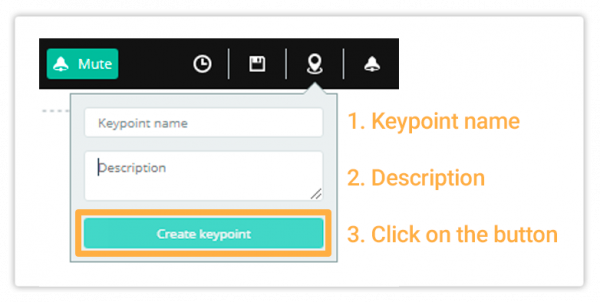 Write down Keypoint Name, Description and Create keypoint.